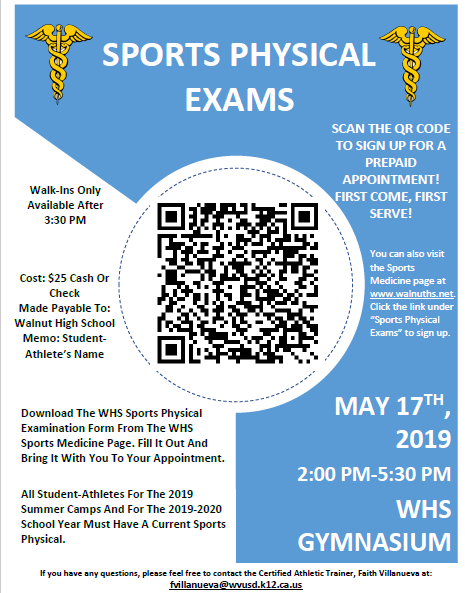 Click the link below to sign up for the 2019 Sports Physical Exams event! Register and set up an account if you do not have one already. Start a new clearance for the correct school year and Walnut High School. Read carefully, complete steps 1 -4, and fill out all of the required information. Electronically sign off on all documents (Parent, Student, and Both). Download the "Your School Physical Form" (listed below) and these forms must be submitted physically to the Athletic Trainer, Faith Villanueva. Upon completion of all steps on athleticclearance.com, you will be provided with a Final Verification Form. Download this form and both, student-athlete and parent/guardian, must sign the form. Submit the following 4 documents to the Athletic Trainer Faith Villanueva, as soon as possible. Take it to your/a doctor (MD/DO) and have them perform a physical. FAILURE TO COMPLETE ALL STEPS WILL DELAY YOUR SON OR DAUGHTER FROM PARTICIPATING IN ATHLETICS AT WALNUT HS.